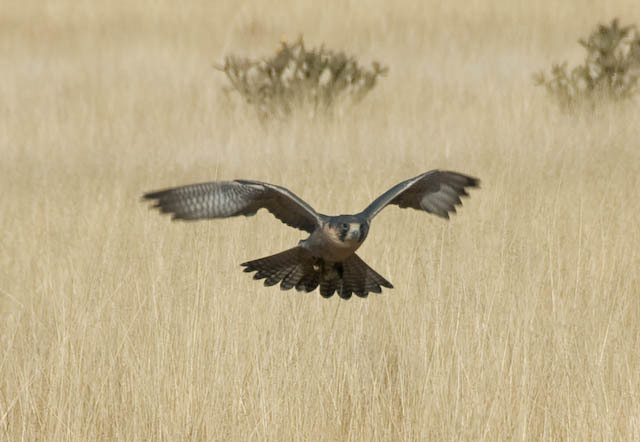 Peregrine Falcons, the fastest animals on earth, are among our favorite birds. 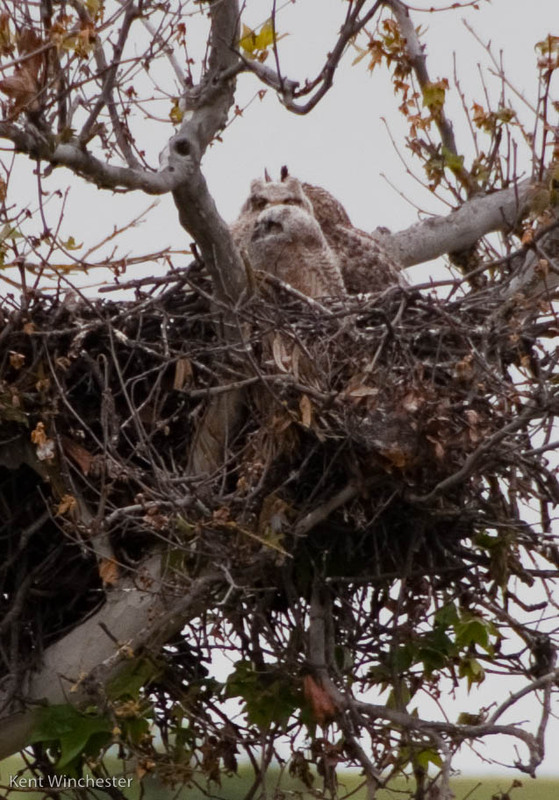 Which is why we look askance at the only two species that are a threat to the falcons: Humans and Great-horned Owls. But it’s impossible to be dubious of babies of either species, which is why we enjoyed discovering this nest on a trip to Northern California recently. We discovered the nest by using one of the most effective bird spotting techniques yet developed by humanity: We spotted a group of bird watchers looking at a tree; so we stopped the car and asked what they were looking at. 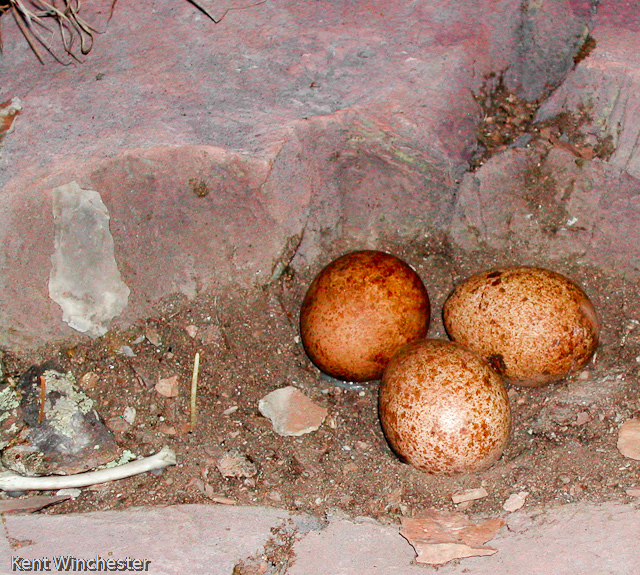 Here is a photo of what the birders found in the nest. 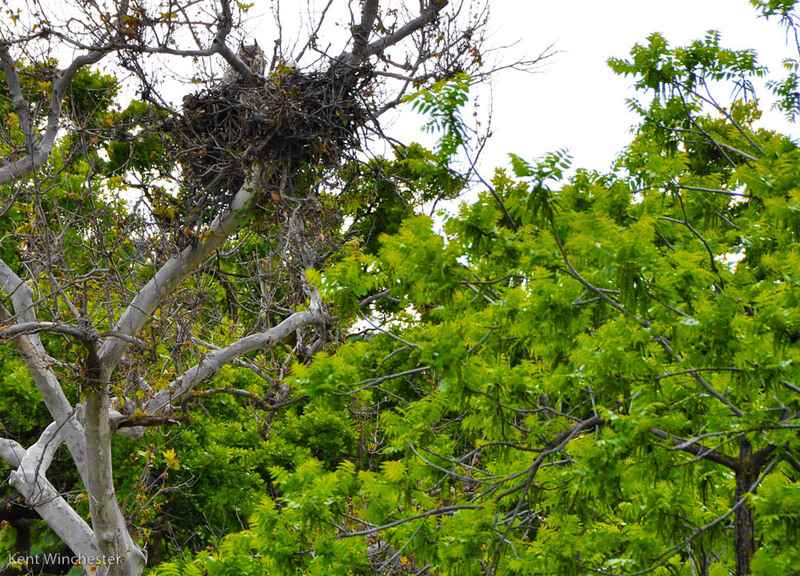 That’s Mom in the background and two Great-horned babies in the front of the nest. From this morning’s Washington Post comes news that some Brown Pelicans have recruited humans in Maryland to feed them during the winter. The pelicans forgot to migrate, a mistake from which they would not normally recover. Brown Pelicans belong on the Gulf Coast in winter, not the northern Atlantic seaboard. The pelicans are causing consternation among the wildlife officials in Maryland who know that a Brown Pelican who forgets to migrate has no business passing along its genes. Natural selection has no patience with that kind of oversight. But nobody wants to watch pelicans freezing to death and buried somewhere in humanity’s genes lies an urge to help individual animals in trouble. Still, it isn’t nice to mess with Mother Nature. Taken as a whole, of course, we spend more time destroying animals’ habitats and rendering the planet unsuitable for them than we do caring for individuals. That there are forty or so Brown Pelicans in Maryland which need rescuing is a success story of sorts. We almost killed the entire species because of our aversion to vampire bugs, a/k/a mosquitoes. DDT was the culprit and it did exactly the same thing to Brown Pelican eggs as it did to the eggs of Bald Eagles and Peregrine Falcons. DDT doesn’t kill honestly, it eliminates calcium from the birds’ egg shells which then break under the weight of the incubating parent. The parent doesn’t die, it just can’t reproduce. In the United States, despite howls of protest from the insecticide corporations, we got rid of DDT in time and the Brown Pelican, like the eagles and falcons, are recovering and have been removed from the Endangered Species list. That is not true for other places in the world, even in the Americas. Friends flew to Mexico some years ago and, before being allowed to deplane, had to stay in the plane while someone came through spraying DDT. They tried to hold their breath. We take no position on the conundrum involved in feeding animals that forgot to migrate. We’re not allowed to. We kept Chuck, the Greater Roadrunner alive, and are now helping one of his offspring get through the winter. The youngster comes around about this time every day; in fact, the writing of this post was interrupted while I took him a mouse. Those rescuers in Maryland are in for a busy winter. I see no reason to think that a Brown Pelican eats less than a seagull which puts me in mind of E.B. White who once raised a baby seagull. He wrote about that bird which, White said, “. . . eats twice his own weight in food every ten minutes, and if he doesn’t get it he screams.” And Brown Pelicans can live for twenty years. Hopefully, they will learn from this experience and move south next year. Otherwise, many more busy winters loom for the rescuers. Pelicans like anchovies. Maybe the people can order lots of anchovy pizzas and share with the birds. The Brown Pelican photograph is by Kevin Bercaw. The other photographs are ours. You can find E.B. White’s story of the baby seagull in his essay “Hot Weather” republished in One Man’s Meat. 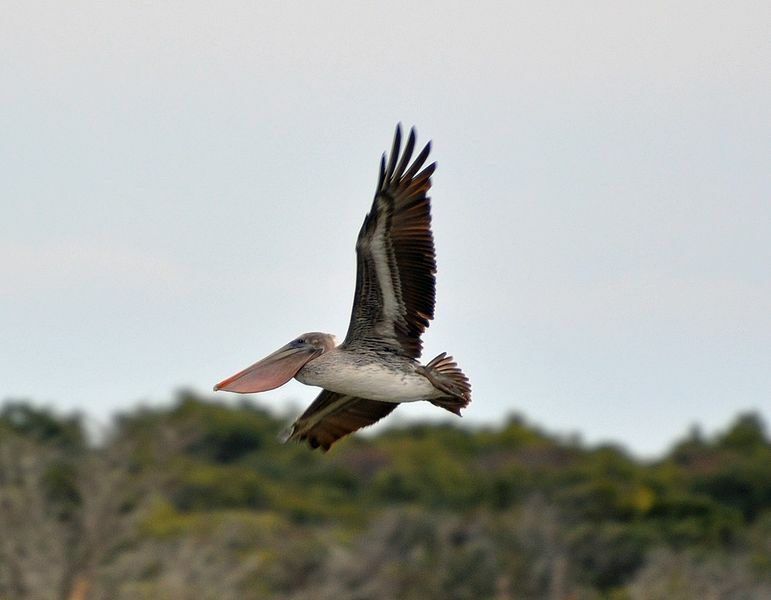 For more blogging about the Brown Pelicans and the issues raised by helping them, see this post. Last week, ravaged by pink eye, I lay in bed, scarce caring whether I lived or died. Only Hilda, my toothless old Mother, bothered to bring me food and quinine. When, at last, my strength began to return, Hilda brought me my computer. With her old, red gums clashing she told me she had found me wildlife pictures to aid in my recovery, just like she used to do when I was a child and came down with the scurvy. Mine was a poor childhood, without even Vitamin C to fortify me for the twenty-mile uphill trudge — both ways — to school through the driving blizzards. Often I was lost for weeks at a time. 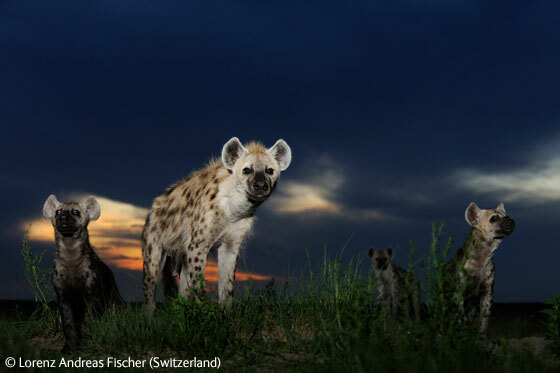 In the days of renewed vigor following my illness, I learned from the computer of the results of two wildlife photography contests which, with my increasing energy I am now able to tell you about by weakly click-clicking away on this keyboard. 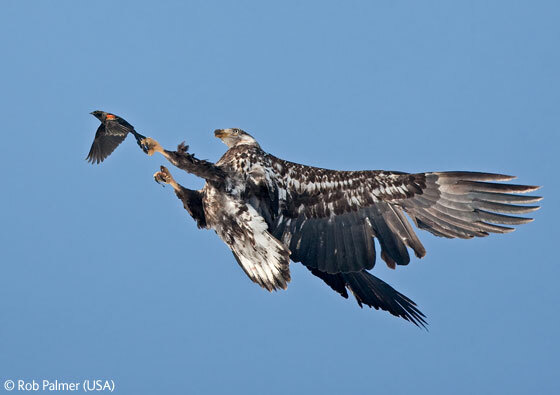 In the first contest, run by the Museum of Natural History in far off London, a place I could only dream about during my poverty-encrusted childhood out on the endless prairies, Rob Palmer of Colorado, USA, won for this photo of a Bald Eagle snatching a Red-winged Blackbird out of the air. 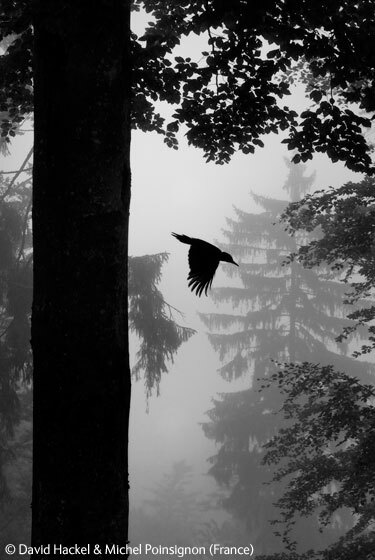 We’ve told you before about Palmer who is one of our favorite photographers of birds. 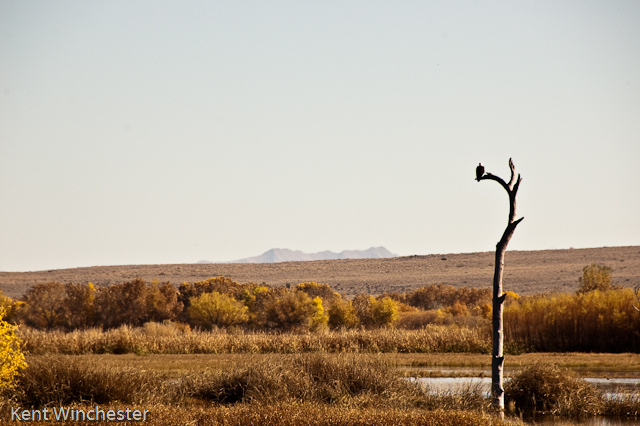 Palmer’s photo wasn’t the only bird photo that won a prize. Several others were also winners. Here is one from Finland, a place almost as cold and dark in the winter as my childhood home. 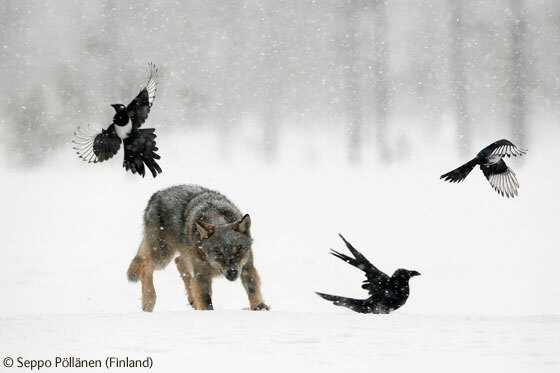 That is a wolf approaching some carrion, driving Ravens and Magpies from his path. I remember the wolves howling as they tried to run me down when I plodded home from school during dark evenings. I often shared my childhood home in the cliffs above the Yukon River with Peregrine Falcons. Shivering there in the cold, I wished they would share their kills with me, but they never did, so I existed on rutabagas. 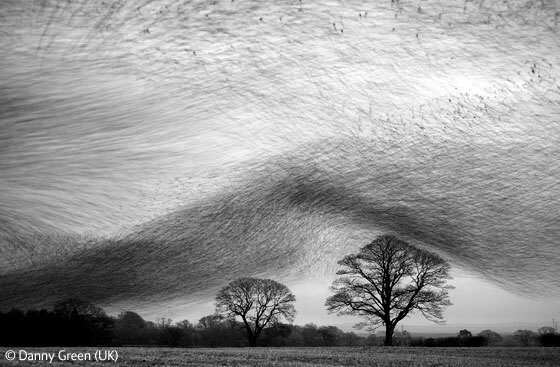 Over in England a single Peregrine can cause panic among thousands of starlings, as in this photo. The falcon is out of the photo on the left but you can see the wave of starlings departing. Another prize winner, this one from France, reminds me of my childhood home deep in the Everglades. Every so often I could take my eyes off the water-moccasin infested swamp long enough to glance into the trees where I would be rewarded with a glimpse of a woodpecker. Like this photograph, that was long ago, when the world itself was still only in black and white, not like now with all the pretty colors. Finally, my strength begins to wane — I’m not the man I once was you know — I leave you with another of the London prize winners. This one doesn’t have a bird in it at all, but I include it because it reminds me of the jackals on the African savannah that used to hunt me as I slogged across the endless Serengeti on my way to school each day. If I live long enough, we’ll be back next time with the winners of the other photo contest. Congratulations to Rob Palmer. And, here is a hint about the next contest we’re going to cover; Palmer won that one too. Sharp-eyed readers will notice the shameless plagiarism of E.B. White in the first three and a half sentences. Most of that was lifted from his essay, “Fierce Pajamas” which you can find in The New Yorker book of the same name at page 7. I stole the idea of simply lifting somebody else’s sentences — just to get started, you understand — from Steve Martin’s “Writing is Easy!” in the same book. Yesterday the Fatfinch took its first step into the ancient sport of falconry. Actually, it wasn’t for the sport at all. It was a morning with a falconer who was teaching the attendees a little about raptors. As a bonus he flew two falcons and a Harris Hawk. As an additional bonus we got to see a little four-inch rattlesnake. We can’t show you a photo of the rattlesnake. It was heading for a little yucca plant as fast as it could go and the only photo we had time to get is a blur. We can show you some photos of the falcons and the hawk though. This is a hybrid Gyrfalcon and Peregrine. The bird was part of a cross breeding program designed to assist Peregrines; which, as all of you know were almost wiped out by DDT. It was early in the morning and the bird was unable to find a thermal so it did not gain sufficient height during its flight to do a stoop. Neither did the second falcon, a juvenile-Red-naped Peregrine. 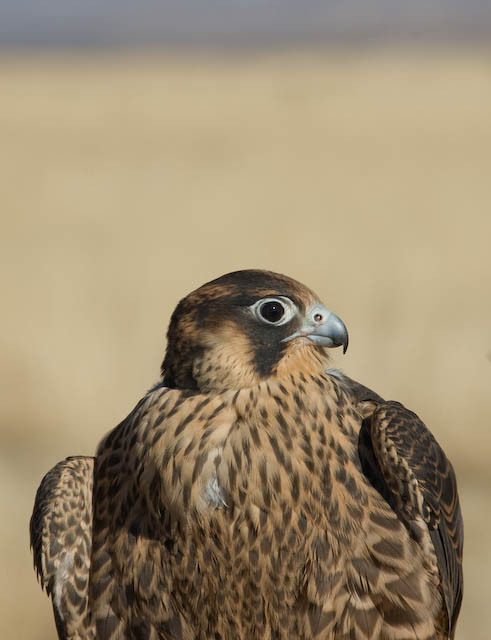 There is some research that indicates that Peregrines and other raptors may actually be able to see thermals upon which they will ride to great altitudes for their hunting. It would something like us being able to see steam rising from a hot cup of coffee. Hmmm. A hot cup of coffee sounds really good. This may be a shorter post than originally planned. 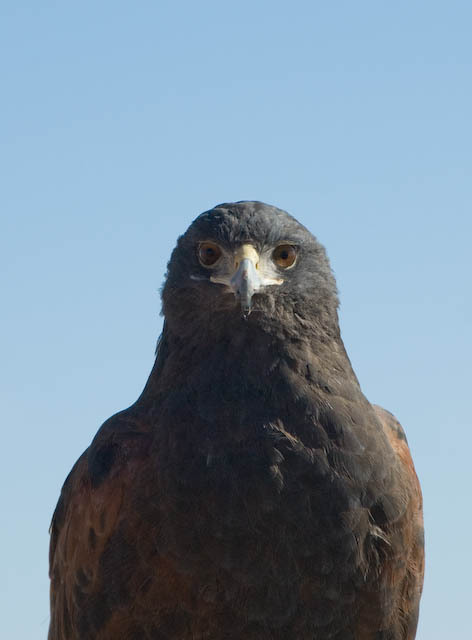 The final flier was a 13 year old Harris Hawk. Sadly none of the humans along were able to scare up any rabbits for the hawk but a good time was had by all anyway. The hawk did not see the baby rattlesnake so it was happy as well. Just as exciting as the morning with the falcons was the afternoon sighting of a juvenile Aplomado Falcon. Photos here tomorrow.